We are a Franco-Welsh couple. After 4 years in Brittany, we moved to the French Alps in August 2014. We are working with UFM Worldwide, a British missionary organisation. 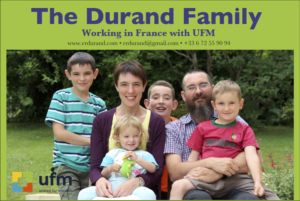 We are based in the suburbs of Chambéry and are involved in various ministries: preaching, Evangelism… Emmanuel teaches part time in the Belgian Bible Institute. Esther was brought up in Bangor, North Wales, in a Welsh speaking family. Emmanuel comes from Chambéry, in the French Alps. In June 2016 he was diagnosed with Chronic Lymphocytic Leukemia (CLL). We have three boys and a girl: Jean-Baptiste, Maxime, Benjamin and Clémence. We speak three languages at home: Welsh French and English and try to be consistent, but it is proving very hard.